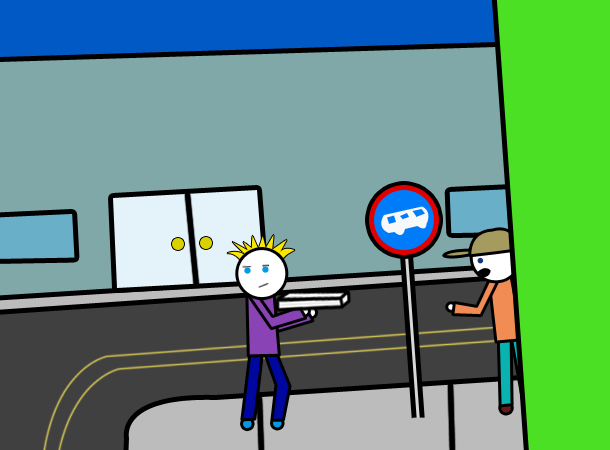 Approaching the apartment across the street, you nearly run right into a guy standing on the sidewalk's corner. He says to you "Whoa! No need to be in such a hurry. Seems like the bus is running really late today. Really, it seems like it should have been here by now...... Say, does it feel to you like the whole world is tilted to the left a bit?" Clearly this man is oblivious to the world in turmoil around him. 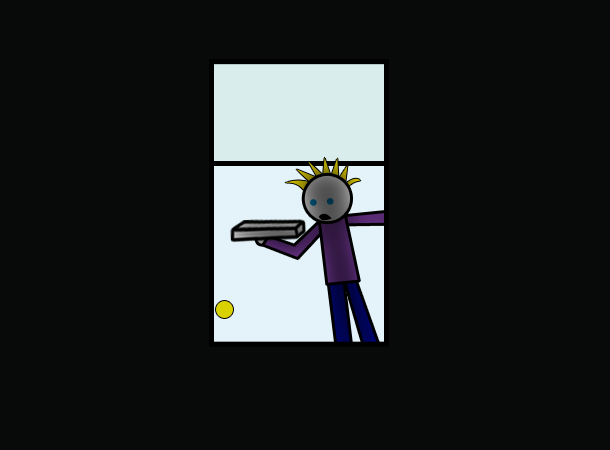 futuramaguy42: Eat a pizza then eat a zombie!!!! jaredvcxz: This one is the more reasonable of the two. I guess this has the presence of zombies and the location of a city in common with Survival Crisis. Not to mention... Well... Um.............. Hm. I used to be a waiter in Schenectady. What about you, Average Guy? It's time to kill kill kill! Going across the street to that other building (the one it was earlier presumed was another apartment building) you find that the front door is quite easily opened, not locked or anything. 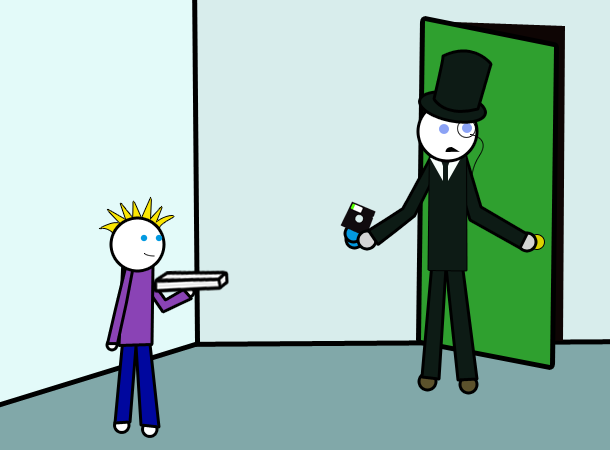 As soon as you get in, you find yourself in a room that's totally empty except for a tall gentleman standing near a tall green door. The moment you enter, he starts to say "Pardon me, but unless you have specific business here, you mus-- Oh, sorry, you appear to be carrying the parcel that my associates and I have been anticipating. If you will hand it here to me, we can at last complete our transaction." Is he talking about the pizza? Fox-Fool: Give him your shoes and the disk. Knowing you need not utter a word in such a situation, you give him, with full deliberation, your shoes and the awesome game you got from the landlord's office. The gentleman replies "... Ah... I can see now what sort of situation your comrades are in. Very well. Save the parcel, and return here in an hour for the alternative exchange." With that... Um... Explanation, he exits via the green door behind him with his new belongings. LORD ZEHRO: Slowly open the green door and peer inside to see what's going on. Curious to the fate of your shoes and excellent computer game, you peek inside the door after the tall gentleman. Inside you see... apparently nothing! The room is only about the size of one person, and is totally dark, but the strangest thing is that you see no floor, just a lot more darkness below you. Surely this man didn't just plummet to his evident doom? Ragdollmaster: My suggestion to anyone who CBA to think of something: Drop the pen and listen to see if it drops so you can discern if it's a bottomless pit. And Trooth, your lazy tactics are evident. 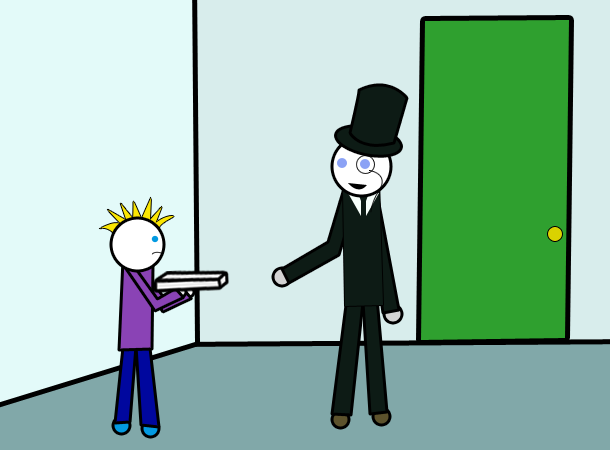 There's a floating doorknob in the frame of the white space, under the pizza. That's the door on the wall behind him. Average Guy entered through it. Look a few scenes back. Listen to me blab on about half life, can't blame me though, it's awesome! It is, it is... By the way Zehro, how did you end up here? Are you somebody I usually recognize with another name, or are you just some cool person who ended up here on his own? LORD ZEHRO: I was actualey looking on this website called ragdollsoft and some guy had a link to the website, so i thought i'd take a look, anyway, i liked the idea so i thought i'd join! Uh... Hm... Well I'm moving into my college dorm tomorrow, and I've been packing and getting ready all day today, so I might have to postpone the next picture. lol, nice to see you, loofi. jaredvcxz: I know you're all wishing that was me. LORD ZEHRO: I won't leave but if i dont post e-mail me, i sometimes forget you see. But yeah i don't mind waiting, oh and by the way, let's not get this guy killed i like zombie survival stuff, humerous or not. Ekoz: no, for reals! i mean, this could be an underground survival chamber with lots of help! futuramaguy42: Welcome to the forum. I hope you enjoy your stay.